I have this exact set and let me tell ya you will NOT be disappointed! 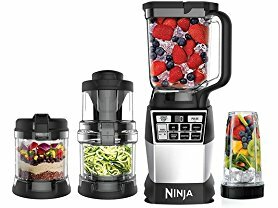 Today ONLY (4/11), *BEST PRICE* Ninja 4-in-1 Kitchen System, Blending, Processing &amp; Spiralizing $169.99 (Retail $259.99). Total Crushing Margaritas for the whole party? Granitas in family size? Done. Blast through everything from ice to whole fruits in seconds. High Speed Blending Transform any fruits and veggies into a delicious on-the-go drink. Juices or smoothies, right in a personal cup—get your day going. Precision Processing Take on simple prep or get ambitious. From a single clove of garlic to a pound of dough to meat for taco night, you've got variety covered. Auto-Spiralizing With minimal prep, different blade types easily turn fruits and vegetables into noodles, apple rings, curly fries and more. -High Speed Blender Cup unlocks tons of flavor for juices and smoothies on the go. -Auto-Spiralizer transforms vegetables and fruits into three different noodle styles. -72 oz. Total Crushing Pitcher pulverizes ice to snow in seconds for creamy frozen drinks and smoothies. -4-cup Precision Processor handles everything from chopping and mixing to dough making and pureeing. -Auto-iQ Technology features intelligent programs that combine specific timed pulsing, blending, and pausing patterns that do the work for you. -Includes one 1200-watt base, 4 high-performance attachments, 3 spiralizing discs -spaghetti, fettuccine and ribbon, and a 40-recipe book.